Hair packs with shikakai are extremely beneficial for the treatment of dandruff and other scalp related problems as we mentioned in the benefits of shikakai. 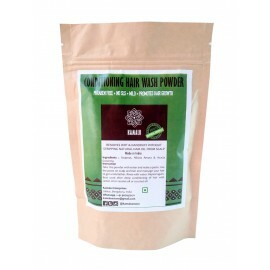 For the hair pack, you will need dried shikakai or shikakai powder, neem leaves, fenugreek powder and some dried amla. Boil all of them in a cup of water. Khadi Pure Gramodyog™ Herbal Shikakai Powder has been used in India for centuries as hair wash &..
Neev AMLA, RITHA & SHIKAKAI Hair Wash 30 ml - Ayurvedic Wonder Herbs for Hair..
 Adds shine and softness to hair Fights dandruff Gives you stronger, thicker hair..
Neev AMLA, RITHA & SHIKAKAI Hair Wash Soap 75 gm - Ayurvedic Wonder Herbs for Hair..
Benefits:A unique formulation of Amla and Shikakai for deep cleansing and conditioning. It ..
Khadi Herbal Shikakai Hair Oil helps in promoting the growth of the hair and prevents the hair from ..
Shikakai & Honey Cleanser will cleanse and condition your hair at the same time. It is mild enou..
An ideal shampoo that nourishes dull, life-less hair. Promotes healthy growth of hair & leaves t..
1 Pcs - Khadi Pure Herbal Shikakai Powder - 80g, 1 Pcs - Khadi Pure Herbal Triphala Powder - 80g ..
- Vagad`s Khadi shampoo contains Shikakai and Honey extract with their wide range of benefits. ..
Vagad`s Khadi Shikakai Hair Oil has the goodness of Shikakai,Shikakai is a great source of essential..
PropertiesWeight290 (gms)Dimensions4.5 (cm) x 4.5 (cm) x 21.5 (cm)..
Vagad’s Khadi Shikakai and Honey conditioner is an intensive conditioner enriched with rich Raw Orga..